Indoor and outdoor staircases lead from a roof terrace to a sunken courtyard at this house in Portugal by Lisbon studio [i]da Arquitectos. 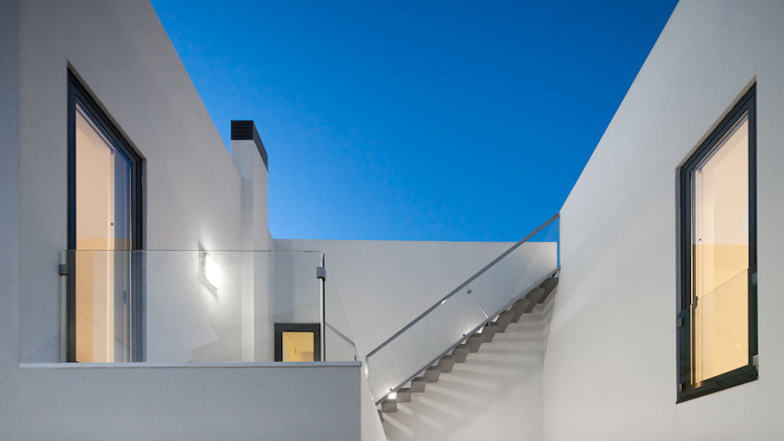 Located in the town of Carcavelos, the three-storey house has a sheltered entrance on its side so that anyone arriving can also look down on the courtyard below. Indoor staircases connect the ground floor with levels above and below, while outdoor stairs lead up from a first floor balcony to the large terrace on the roof. A second balcony is recessed behind the bright white facade, diagonally above a glazed living room that projects towards the street. The house is named Casa DJ after the initials of its occupants, rather than because a DJ has moved in. See more houses in Portugal here, including the concrete residence we featured earlier today. A central patio divides the house into two parts and organizes the interior spaces: on the west side, an open horizontal space to the garden receives the dining room and the kitchen; on the east side, a vertical space, located at a lower level in relation to the public route to ensure domestic privacy, receives the living room. Large apertures establish the contact between interior and exterior. In the horizontal space the relationship is made by the continuity with the garden while in the vertical space is the blue sky that dominates the entire landscape. The private areas, one suite and two bedrooms, are located in the upper level as well as the access to the roof terrace. The simplicity of the facades contrasts with the complexity of the different spaces of the house. The white wall surfaces and the gray shades of the floors give a unit character to the entire construction.